ULTRApadded™ Grip Orthosis is ultra-comfortable. Custom fit the orthosis by bendign the foam-covered wire structural platform to accommodate any wrist angle. Unique tabs at the thumb web space locate and stabilize the hand. No thumb abduction. Self-padded terry cover is removable and washable. 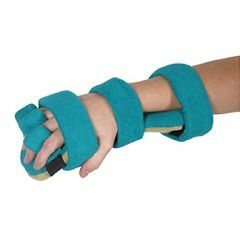 Save on inventory -- splint fits left or right hand. Finger spacer (included) can be removed if not required. Includes laundry bag. Aqua. Sizing: One size fits most men and larger women. Maximum width at MP joints: 4½". Maximum length from longest fingertip to midpalm: 5½"+. CAN I USE THIS ON A STROKE PERSON WITH NO MOVEMENT EXCEPT I CAN PULL MY FINGERS OUT. Asked on Oct 16, 2015 1:52:58 PM by GUYLENE from OKLA.